The 100 Slovenian tolar bill featuring painter Rihard Jakopič. I hate carrying a wallet weighed down with paper bills and coins. I hate worrying I might lose a $20. I detest doing math on the fly as I count out bills and then check that I'm getting the right change back. It drives me crazy wondering where'd all that cash in my wallet went. Can the Fed really not send me a monthly statement, seriously? Because that would be helpful. All of those hates get compounded tenfold when I travel abroad. Plus there's the added stress of which bill is what and how much is each coin worth? Is the one with the funny edges worth 100 or 10? I tend to stand there puzzling over my handful of coins until the shopkeeper takes pity and plucks the ones he or she needs out of my hand. Thanks, think I'll just charge it next time. But there's another part of me that loves the jangly funny shaped coins and the weird looking dudes on the bills — yes, even abroad, they are usually dudes. We traveled to Slovenia in the 1990s. This was during the brief period post-Communism, pre-European Union when the currency there was Tolars. 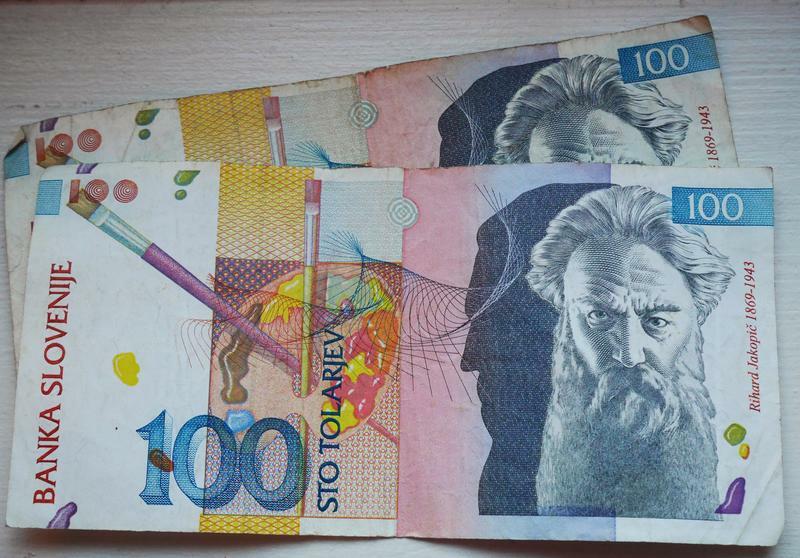 The bills were beautiful and colorful with images of art, architecture, literature and the people who made their mark in Slovenian arts and humanities. My husband and I fell in love with the 100 Tolar bill we called 'the Rasputin.' We had no idea who he was, but we were fascinated by the bill that featured the hairy guy with the dark eyes that harbored a wild Rasputin look. We were there when the Internet wasn't part of daily life. So until that 80-cent peach I charged got me wondering again about Rasputin, he was simply the wild-eyed guy on the 100 Slovenian Tolar. 'Rasputin' is actually Rihard Jakopič, a Slovenian Impressionist painter. But even without knowing who Rasputin/Jakopic was, I realized I had already had gleaned what I needed to know. In the 1990s the Slovenians were really proud to be independent and to lay claim to their cultural heritage after decades being part of the Socialist Federal Republic of Yugoslavia. That's the thing, show me the money and I'll show you what a country values. Take Canada and Iceland. These are two countries where for every monarch, politician or cultural treasure — hockey in Canada's case — there's a coin or bill celebrating nature and wildlife. Loons, dolphins, crabs, fish, bears. It's no wonder Iceland considered adopting the loonie during its own financial meltdown. Or consider England and the US. Our system of government is core to our identity. Queen Elizabeth reigns supreme on the face of all British coins and bills with the opposing sides celebrating the British superstars of the arts and sciences, Jane Austen and Charles Darwin; Edward Elgar and Michael Faraday. In the US it's a celebration of democracy — presidents, monuments to presidents, our states with a little bit of "in god we trust." Separation of church and state, feh. In the US, currency is God and country. One of the fun parts of travel: Inspecting the shapes and colors, the lettering, and the images on the local coins and bills. Things that provide a window into the culture and values of the place you're visiting. Things a credit card definitely does not tell you beyond what airline you like to fly, what bank you use, or what brand you identify with — Disney or National Geographic? Mostly when I travel now, I might have a few Euros or dollars in my pocket in case of emergency. But more and more coins and bills are a vestige of travel from times past. On my last trip to London, I don't think I bothered to get any cash. Because in most Western developed countries the majority of transactions happen like they do at home in the US — with a credit/debit card or even cybercash. Because it's 2015 and nobody carries old school cash. But it's just one more way we're becoming a global society without the quirks and reflections of our unique cultures and histories. I don't have to contend with the hassles of bills and coins, but another window into culture is being slammed shut. Tamar Charney is program director of Michigan Radio. Your dollar is worth more. At least, it is in Canada. Just four years ago the exchange rate meant it took more than one U.S. dollar to get a Canadian one, but now you can get a Canadian dollar for only 77 cents American.